Thursday was a momentous day! We peeled off the shrink-wrap plastic from the domes, and opened them up to allow in some fresh air and undistorted sunshine for the first time in months. I managed to re-attach the rings for pulling the struts down without falling off the ladder. Kenny was very excited to try his hand at catching the rings with our hook. He could JUST reach them when he knelt on our bed. Maybe soon he can even reach the ones in the main yurt! From the outside, it was refreshing to see them popped open, and yet the indoor temperature was still quite manageable, dropping to a low of about 17 degrees, and then climbing back to above 20 once the full afternoon sun was shining down. While the actual difference in air and light may have been small, they sure seemed huge to us in comparison. I think I speak for the whole family when I say that it added a spring in our step! It also helped that we had some guests visit, and so we gave the yurts a bit of a spring cleaning that morning too. Our guests were very gracious and we thoroughly enjoyed their company. Hopefully we can have them back again soon - Kenny seemed to really enjoy sharing his snow fort with them, and even (only ever so slightly protectively) his Lego! With the extended downtime of the tractor, gathering firewood became a bit more challenging. As such, the warmer weather has also lulled me into a sense of not needing so much to burn. Of course, the arrival of more, and then more snow began to gnaw on my sense of heating security, and watching the woodpile dwindle finally got to be too much for me. With chainsaw in hand, I headed off on foot to see what was dead, but still standing, and within walking distance of the yurts. Up near the front driveway, where it crosses a boggy section, there were plenty of smaller candidates. I cut up about eight or them, and then, drenched in sweat from the effort and the rapidly rising temperature, I returned to the yurts for a lunch break. After lunch, Kenny and Donna pitched in to help me drag my treasures back to the woodshed, where we piled them alongside the path. After we had them all arranged, I fired up the saw again and cut them up into stove length. Donna also gathered up a number of the smaller, dry limbs that had broken off, and they have proved to be great at starting the fire - sometimes too great! Although it didn't amount to a huge increase in my woodpile, it will help to get us a little further along. This weekend they are predicting our first double-digit temperatures, and yesterday we were able to get along with firing the woodstove only twice (morning and night), so our needs are diminishing at a similar pace to our resources. It will also be a help once we can dig out our propane tanks and be able to cook on the propane stove again. My in-laws tell me that last year the snow was generally gone in March, and by April they were raking the lawn. I know when my brother and I arrived at the end of April, we could only find a little snow tucked away under some trees here and there. We freely walked about on the homestead and unloaded the trailer with all our possessions. This year is quite different. We suffered through a record breaking low temperature, and have ploughed more than our fair share of snow. On Friday though, Mother Nature decided we could take a bit more. It began snowing Thursday afternoon/night, and all through the night we heard the wind gusting and blowing stronger than ever, and then all day Friday it continued to snow. We cancelled sauna night, as it wasn't realistic to be able to walk through the drifts to even GET to the sauna. I'm not sure if it was the right decision to hold off on ploughing until Saturday morning, when the snow finally stopped falling. I contemplated whether or not it was better to do a run with the tractor every few hours during the storm, as compared to waiting and doing it all at once. Either way, I am not sure where I could have put the snow, and I'm still not entirely sure, it being Sunday morning now, and the driveway MOSTLY clear, but still rather narrow in a few places and likely requiring a bit of hand shovelling to widen it enough. Now that the snowbanks are clearly about two to three times the height of my grader blade, it cannot accomplish much. The front bucket works marginally better, but it still requires me finding a way to get far off the drive to dump the snow, and I have to raise the bucket nearly to its eight foot limit to be able to dump it above the banks. In spite of waiting a few hours in the morning for the temperature to get to -10, the tractor was still a struggle to get started. At last it roared to life, and while I spent much of the day on my backside in the tractor seat, trying hard to at least clear a walking path from the vehicles to the road, Donna slaved over multiple shovels to the same end. Kenny tagged along and was tremendously distraught when he found that his snow fort had blown in. It was some effort to explain to him that it was simply an act of nature that had done it, rather than Daddy being careless with his snow clearing efforts. Later in the day, in better spirits, he checked on us again to much better effect. He was in his glory conquering the beam pile and clearing it off for us. As the afternoon turned to the supper hour, Donna and I cleared away the vehicles and then set down our shovels. Today I will try to get back at it to widen the driveway enough to get our car in and out. Hopefully some warmer weather will come along to assist us in our snow removal. Having access to a large supply of slabs is a bit of a plus when you are heating with wood. It feels good to be able to use up this by-product of milling lumber. One issue though is that they need to be cut up, and they are generally smaller than entire trees. This means you need to find a way to bundle them together and then cut a bunch at once. Last year I had some leftover two by fours which I built into a frame for cutting up my slab pile. At the end of cutting through my pile, I just continued on cutting up my frame, as it was in such poor shape. This year I thought of something similar, but then opted for something a bit more expedient. Here is a disclaimer - I am describing something I do. I am not in any way advocating anyone else to do this. First off, I suit up with my chainsaw chaps and ear muffs. I generally try to be as safe as possible when using the chainsaw. At least in this respect, I am able to work on a flat, clear surface with little overhead danger. I set up my aluminum ladder, stacked a number of slabs through the rungs, and then put on a ratchet strap to bundle them together securely. I also tried to anchor down the legs of the ladder with some more planks and cinder blocks. This was probably overkill, but again - safety first! Then, with my slabs held at a comfortable working height, I alternated sides (to try to keep the loads balanced), cutting down the slabs until I made a final cut on either side of the ladder. The final cut I made with great caution, not being eager to make contact between my saw and the aluminum. I was obviously concerned about the saw, the ladder, and my person! Eventually I even placed two bins under each side of the ladder, so my cut pieces of slab fell directly into some bins for carrying back to the woodshed. I have to confess to some pleasure at how well this system has worked for me. Again, the place to be careful is when I am cutting close to the ladder, and just being mindful of the stability of the ladder as slabs are cut away. As a side effect of spending the winter milling beams for my sauna and workshop, I ended up with a huge slab pile. As well, I had just roughly piled up a rather impressive pile of 1" thick boards off to the side. They weren't properly stacked though, just basically laid one atop the next with no room to breath, and no great concern for being flat or level. Once the last log was milled though, Grandpa initiated a programme to ensure that these boards would be useable. First he shoveled off the snow nearby until he was down to a rather large, flat area. We then cut down a nearby poplar tree (one that was rather close to the driveway, and more a nuisance than an addition to the natural landscape). I cut the tree into 8' lengths, and milled one side flat. We lay these lengths down in the newly cleared area, and shimmed them to be flat, with no pretense towards level. Over the course of the next few days and weeks, as weather and my work schedule permitted, we worked together and transfered my pile of rough cut boards to the new area. As we did this, Grandpa eyeballed up each plank and would sort them into piles, based on the amount of useable wood vs. the amount of bark still present. When we had a stack of about five or six good boards, I would put them back on the sawmill on edge. Clamping them gently together, I would run the mill down first on one side, and then flip the stack, and remill it again on the next. This gave me a nice, clean edge on both sides of my boards, creating something much more useable again than just a slab of wood. For example, to create a 1"x4" board, we generally were starting with something closer 7" including the bark. We would place a stack of these on edge on the mill, and do a pass at about 5 1/2". This would take off most all bark on one edge of the stack. I would flip the stack over, and mill again at exactly 4". This took care of most of the remaining bark, and would give me a very useable 1"x4" board. These measurements were obviously not hard and fast - often we were shaving just an inch from one side, and three or more from the other. You just tried to keep similar boards together to make yourself more efficient. It was surprising how quickly we made short work of my rough pile, and came up with a very large pile of lumber, ready for future projects. Having this mill has been a real blessing around here, and I look forward to many good years of future use for upcoming projects. First off, I will apologize that there are no really good pictures of this repair "in progress". Many key portions took place while our official blog/homestead photographer was doing other chores. In future, I'll try to remember to snap some pictures myself, even if it means interrupting my "flow". As you will recall, the Yanmar fell out of commission a few weeks ago when the king pin on the front left of the vehicle sheared completely off. Further investigation really pointed to this being a weakness in design. The "transmission" for the front wheels appears to be located directly at the wheel, beyond the axle and steering linkages. This seems to me to put some heavy torque and weight outside of the single bolt (actually the king pin) that holds the entire thing together. Not only does this pin hold the wheel and transmission to the axle, it also transfers the force of the steering wheel to both wheels via a linkage running under the tractor. Asking Google reveals that I'm not the only Yanmar owner who has suffered this sort of fate. Calling around, I was able to source a used king pin from Hoyes Tractors in the U. S., for US $400.00! This was not really a thought that I relished. Instead, I called the fellow who had initially put in our driveway entrance. F! was one of those fellows that I am often in awe of - he talks casually about moving engines between dissimilar vehicles, and can throw out phrases like "I changed out the 375 for a 444 last year" (paraphrased) - things I have little to no idea of their meaning, but they sure sound impressive! He looked over the Yanmar appraisingly last year, and even then I asked him if he would have a problem looking it over if I ever ran into trouble. At the time, it was a mystery box to me - I would sit on the seat, pull levers, and try to see what they did. Hopefully now I'm a bit more versed in its workings. He came by to take a look at the situation, and offered some great advice about how to dismantle the last few components that were giving me a hassle. Namely the tie rods for the steering mechanism. They run from the steering wheel to a bracket above the left wheel, which, via a 90 degree linkage, travels to the right wheel. I had been unable to free the linkage from these tie rods, and with the top of the king pin still firmly wedged into it, that was a key step in getting things dealt with. With the broken bits in hand, I headed over to F! 's shop, where it seems he could fix anything you care to bring him. He used a press to push the remainder of the king pin from out of the linkage (I believe he said it took about 15 tonnes of force), and we looked over the damage. Cleaning things up, he pointed knowingly to the surface, showing where it had cracked partially in the distant past, and then fully in the more recent past. He suggested that if we couldn't find another solution, he could possibly just weld it back together, but he didn't seem entirely keen on that being a good or lasting fix. Instead, he called up R! - a local fellow that seemed to be a machinist by trade, and had a small shop nearby. R! said he didn't have time to fix it right away, but was willing to look at it if we wanted to bring it by. I loaded F! into the truck (he was nursing a broken ankle all this time), and we headed off to meet another new neighbour! R! turned out to be another really awesome fellow. He is a pilot, having built his own aeroplane! He also was able to take in the situation with the king pin very quickly, and had a solution - boring out king pin, inserting a smaller pin inside, then welding it all together and machining it back to its original condition. While I didn't need the part for a week or so, as I was going to be visiting my parents with Kenny, he called within a day or two to report he was finished and I could pick it up! After another very enjoyable visit with him, I brought the pin home, and headed off on vacation. Finally, on F! 's advice, I purchased a small tube of "blue - sensor-safe gasket maker". Grandpa dropped by the next morning to light a fire under me on this repair, but in my defense, I was already heading out the door. I welcomed his company to help out with this, and on his suggestion, we went to his workshop to take advantage of his selection of tools, and especially a bench vice. It was with not a little head scratching that I tried to puzzle out how to re-assemble the various bearings that were involved with this thing. It was helpful to look at the king pin itself and see the wear marks at different levels. One difficulty right away was that nothing would fit over the key in the shaft. Grandpa pulled it out with a pair of vice grips and then things moved much more quickly. First I cleaned off the base of the king pin, and then applied a thin bead of gasket around the bolt holes, and around the perimeter of the base. I slid the casing for the transmission over the king pin, and let it come down onto the base. Finger tightening the bolts on the base of the king pin locked it nicely to the casing, and then I slid on first a small ball bearing, then the main gear. Inside this gear goes two "roller" bearings that fit nowhere else. Then another small ball bearing, then a large ball bearing, and finally, a "sleeve". I carefully carried this contraption back to the tractor, where I wiped off the gasket of the casing cover (which was still attached to the axle), and then slid the king pin up through another large ball bearing (which I hadn't noticed earlier, but was still wedged up inside the casing cover), and finally up through the casing cover. I inserted the key in the side of the top of the king pin, and then tapped on the steering linkage. Next came a stack of thin washers, followed by a larger washer and then the nut. I tightened the nut down with the largest wrench Grandpa had, and we seemed to be in business. Grandpa was a bit concerned that turning one wheel caused the opposite one to turn in the opposite direction. While I thought this was a normal outcome of a differential gear, I also wasn't well versed enough in mechanics to outright discount his doubts. Of course, I also had to point out that we couldn't possibly have screwed up the re-assembly of things so much as to cause this effect. With huge amounts of WD-40 and screwing the nuts up and down the linkage shafts, we were able to free them up enough to allow us to assemble them and tighten the nuts in the proper position. These linkages don't seem to have a means to hold the "bolt" in place as the nut gets tightened, so as soon as things begin to get tight, the nut starts to spin the bolt, and you don't make any progress on tightening things. We needed to disassemble the linkages, hold them down lower with vice grips, and then spin the bolts up and down the shafts about three or four times before we were confident enough that they would go on without the vice grip. This did work for us. I headed over to the opposite side of the tractor to check on the adjuster for the toe-in of the tires. It was a simple turnbuckle mechanism, but had been screwed down tight previously, giving me no chance to observe the threads to see which was a left-hand thread, and which was a right-hand thread. Grandpa walked over to see what it was about, and we agreed that we needed to undo the linkage from the steering side of things, and then use the entire shaft with a pair of vice grips on it to try to spin the linkage open a bit more. This was very fruitful! We were able to see which side had the left-hand thread, and which had the right, and we ended up dismantling the entire thing, lubing and cleaning it with WD-40, and then re-assembling it with lots of room for adjustment. Climbing into the tractor seat, I was not a little exhasperated to find a lone, large, flat washer hanging from one of the hydraulic levers. Oh yes, I remember now, it came from between the steering linkage and the top of the wheel casing! I put it there for safe keeping when the tractor first became incapacitated. I disassembled the top of the wheel assembly once again, inserted this washer, and then reassembled everything. Sigh. Using the turnbuckle, I adjusted the wheels until they mostly pointed in the same direction, with enough of a hint of toe-in to make me think we were on the right track. Removing the right wheel, I drained out the remaining hydraulic/transmission/lubricant fluid from the right wheel (via a 20mm bolt on the bottom of the wheel transmission - so to change the fluid on your front axle, there are actually TWO drain plugs that need to be opened). Then, I tried to add a very approximate .8 gallons via the plug on top of the axle. This seemed to fill rapidly, so I would stop regularly, and rock the axle back and forth to even out the fluid levels. I also spun the wheels by hand to get them well coated and push out any air bubbles. I lifted the bucket up, and removed the stump from under the axle where we had left her, low these many weeks. Slowly, I lowered her back onto the wheels, and it held! Of course, the proof was in the pudding. I lifted the bucket further, and then put her into reverse. Slowly releasing the clutch, I actually moved - in reverse! Both wheels moved in the same direction and I was greatly relieved! I turned her around in front of the vehicles, pondered what would happen if she broke down halfway along our driveway (no answer to that - other than a shudder), and headed down the driveway. About two thirds of the way, I couldn't take the pace anymore, and switched from second to third gear (still in low range though), and trotted to the end of our drive. Again, cautiously turning around, trying to stay off the public portion of the road, I headed back triumphantly! I parked her a little further out of the way, and would have done a victory dance, if not for my tremendously sore ankle. Last Wednesday I was fortunate enough to get an appointment at the local clinic for my very painful ankle. It appears now that I'm suffering from some tendonitis. I hope that it will get dealt with. I'm going to try a little physiotherapy, and also get a follow-up ultrasound to ensure that nothing more serious is happening. At 2:30 on Thursday morning, as we were all snuggled in our beds Donna and I both were awakened by a deep and ominous rumbling that ended with a muffled crash. "Mrmph, I guess so, where's my headlamp?" My mind began to come up to speed. It sounded to me like it came from far in the bush, and I had visions of logs rolling down into the ravine. This wasn't very realistic, the sound was much louder and longer than nature could normally present. Next I began to think of the woodshed. 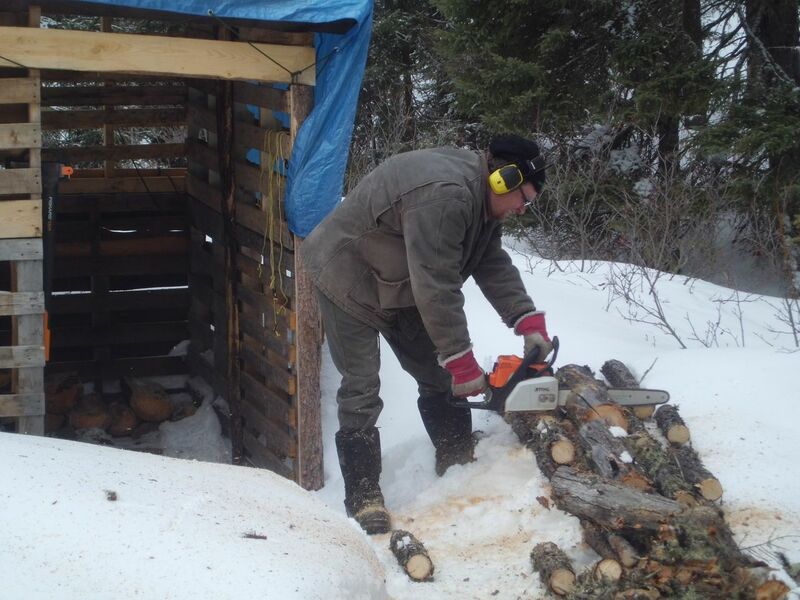 We had a fair bit of snow again lately, and I knew that the load on the woodshed was very heavy. Wandering out into the darkness, I was at once relieved, and then frightened to see that the woodshed still stood soundly. There was only one other structure on our property that was capable of making that sort of noise - and I had been eyeing it with suspicion late in the previous afternoon. Smirking at my earlier self, I pointed out to him that he SAW the broken, rotted roof joist. I reminded him that both Grandpa and I had tried to shovel off some of the snow load from that corner, worried about the condition it was getting into. He replied with some vague excuse about never imagining that the failure of one joist would bring down essentially the entire tent. I wasn't buying it, but instead just admonished my past self to remember that proverb about ounces of prevention and thousands of pounds of cure. I returned to the yurts and explained the situation to Donna. After administering a half an ounce (give or take) of Alberta Premium to calm my nerves, I tried to empty my mind by watching a movie on the iPad. This didn't really work, and I eventually drifted off around 4:30 or 5:00. The next morning, Grandpa arrived to take stock of the damage. Donna had emailed Mummu in the middle of the night so that she was made aware of things as soon as she arose to check her email and the weather. Grandpa took control of the situation and immediately began clearing out a tunnel to get deep into the wreckage. We were very fortunate, the walls remained standing for the most part, and it was a cave in of the roof essentially. Also to our benefit - the stored tools and gear were all around the perimeter, so they seemed to escape the brunt of the falling snow, canvas and beams. Over the course of the Easter weekend, Grandpa and I managed to jack up and prop up each joist individually, until they were back in their original locations (give or take ;)), and then fasten them anew. Chainsaw carpentry came to our rescue when I was unable to get to my other saws. I opted to totally replace the rotten joist with a new board, and then added extra stringers and supports throughout the entire structure. The damage was far, far less than it could have been. My table saw is damaged beyond use as a table saw, as the top surface was cracked through and no longer can be considered true. But the stand is fine, and the saw will likely still cut, just without accuracy. My mitre saw was hit hard, and was pushed at a large angle, but seems to not be suffering any permanent damage - I loosened the clamp and returned it to an upright position. Using it for the first time will really tell whether or not it is okay. Many of my Ryobi 1+ tools ended up getting wet from the leaking roof. I am leaning towards replacing them with higher quality components as they pass on. The tarp on the tent proved to be already on its way out. Shovelling the snow off, and simply pulling it to and fro, caused it to disintegrate. I will have to replace it as soon as I can next get to town. There was no reason not to take time out for Easter traditions :). On Tuesday, Grandpa and I were able to make quick work of positioning the final three rafters, and I have to give him full credit for the entire job. He always saw the best and quickest way to jack and prop up the wreckage, and didn't let up on getting the job finished for anything. I especially liked the deliciousness of uncovering these two messages from N! and V! from my dojo, inscribed on the roof just where I took off my first shovelfuls of snow - "Good Luck, You're going to need it!"